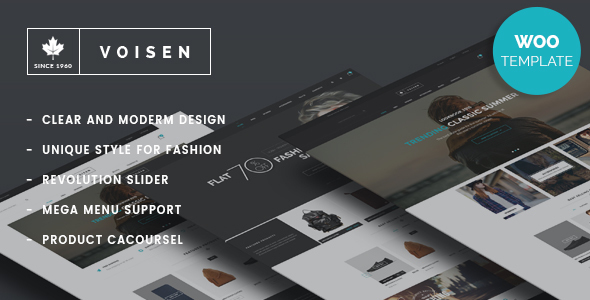 Voisen is a professional WordPress theme. It comes with a lot of features and variations: Responsive Layout, Mega Menu, Page Builder, Awesome Slider Revolution, Product Quick View, Easy One Click To Install, … and so much more. Easy to use, awesome and powerful. These are the words that we talk about Voisen. You will be able to build your website in a snap without coding knowledge. Are you ready to get it for now? 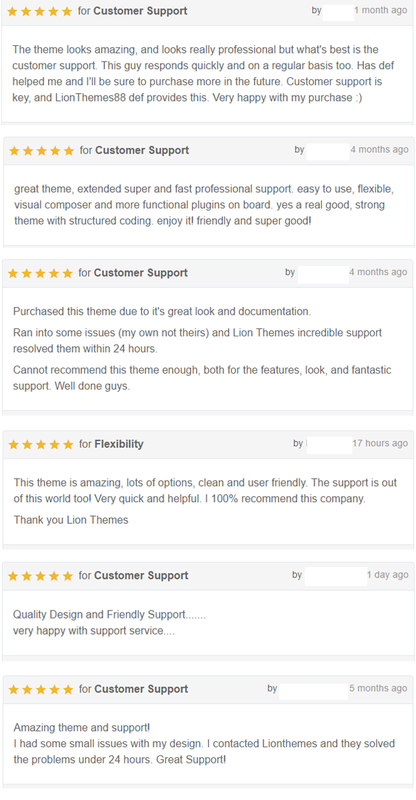 - Update LionThemes Helper plugin to have more apply 6 columns setting. - Fix header overlay behide product image. - Add new options to select hover effect on single image element of Visual Composer. -Fix: Not show sub-categories in product category page. -UPDATE: Visual Composer newest version. -Fix: Check has widgets & config to display setting on header. Fix: A PHP error in extend visual composer widgets. -FIX: Header color apply for menu list icon on mobile and search icon. -NEW: New lazy loader image for shop & products list. -NEW: New version of awesome font to support snapchat & whatsapp icons. -NEW: New option to collection products by list ids in Specify Product VC widget. -Fix a php warning in gender social icons. -Fix & replace old functions of woocommerce in thank you page. -NEW: Autocomplete Ajax search products. -FIX: Non effect of wow display blank on chrome. -FIX: Show/hide copyright and related products not working. -NEW: Social share show/hide icons options. -FIX: Blog widget grid layout on mobile. -FIX: Topbar sub-menu overlap style issue. -UPDATE: Visual Composer plugin version. -UPDATE: Revolution Slider plugin version. -UPDATE: Compatible with woocommerce 3.0.0. -UPDATE: Visual Composer plugin newest version. -NEW: Random order for testimonial. -FIX: Page, Blog post content pagination style issue. -FIX: Remove compare items does not work. -NEW: Loadmore products (scroll/button) for shop page with ajax. -UPDATE: Theme helper plugin (important). -UPDATE: Footer change to widget manager. -NEW: Show up effect for voisen VC widget on home page. -NEW: Support mailchimp newsletter form. -FIX: Text color in minicart. -FIX: Grid layout row reset for all screen size. -UPDATE: Woocommerce layout in theme work with new woocommerce version. -NEW: Header, Footer full color customize options. -NEW: Auto rotate for all theme widget carousel options. -NEW: Sidebar for static page, page template for container with sidebar. -NEW: Archive action show/hide buttons. -FIX: SQL Query by Date schedule of post & product widgets. -FIX: SQL Query by category of product widgets. -FIX: Excerpt length param for blog vc widget. -FIX: Sale price not show in quickview. -FIX: Shortcode key not correct in Testimonial vc widget. -FIX: Style theme option changeable on child-theme. -UPDATE: Standard column width for mega sub-menu. -UPDATE: Full language keys file. -UPDATE: Child theme apply css in style.css (still has less format). -FIX: Date of post on home page not correct. -FIX: Custom VC widgets not save values again. -NEW: More options to show/hide topbar, top search, top card on header and Product tags on footer. -NEW: Hot label for products list on home page and other lists. -NEW: option to show/hide related products, up-sells products and brand logos on product detail page. -UPDATE: New revolution slider plugin version. -UPDATE: Layout for Subcategories list display type. -FIX: Add to card for variation product on quickview popup. -FIX: Style for variation product table options. -UPDATE: Accordion toggle for categories list on sidebar. FIX: Shop page work with newest woocommerce version. UPDATE: Newletter popup display config. UPDATE: Display social share icons config for product page. UPDATE: Testimonial vc widget autoplay & speed options. UPDATE: Footer product tags custom title. UPDATE: Oneclick function to save footer menu options. NEW: Newletter popup function on load page. FIXED: Scroll bar visible on feature product section on Home shop 2. FIXED: Default shop list page layout. UPDATE: Lastest version of Revolution Slider, Mega Main menu, Visual Composor plugins. UPDATE: New one click import simple data section. UPDATE: Layout for Archive & Category post. ADD: Inherit theme options for Page config in back-end. FIXED: Layout use page config independent of the Theme options. FIXED: Remove item minicart in header.